Germany pushes the envelope when it comes to how far north you can successfully grow grapes. In spite of the challenges that accompany a cold climate and finicky vintages, however, the country consistently produces many delightful wines. Riesling, the country's most notable accomplishment, is prized for its subtle transparency. It seems as though the land itself speaks through the wine, a dynamic example of terroir that makes the trials of winemaking in Germany worth the vintners' anxiety over early frosts and steep vineyard slopes. Slopes, soil, rivers, and sun are all important to German winemaking regions. The best vineyards are planted on south-facing slopes, to maximize on the light and warmth. Some of these slopes are quite steep; in the Mosel, for example, some slopes are at a 70 percent gradient! The dramatic angles of the land eliminate the possibility of mechanical harvesting. Instead, on the steepest slopes, workers strap themselves to the hillside with baskets on their backs and hand-pick the grapes. The best soil retains the day's heat within the land, radiating it back toward the grapes. Additionally, heat radiation occurs near rivers, when sunlight reflects off water onto hillside vineyards. Vineyards in Germany are strategically planted near rivers and tributaries. Considered the finest of the German wine regions, the Mosel-Saar-Ruwer produces Rieslings of exquisite clarity. Slate soil is the driving force, creating lean wines with piercing acidity and aging potential. Some of the most famous estates in the Mosel are Joh. Jos. Prum, Dr. Loosen, and Fritz Haag. Riesling is the star of the Rheingau, accounting for more than 80 percent of plantings. Compared to the piercing accuracy of flavor in Mosel wines, Rheingau Rieslings taste broader, with fuller and riper fruit flavors. The highest quality Rheingau Rieslings are those labeled Erstes Gewachs, or "first growths." Additionally, Rheingau wines labelled with a double Romanesque arch indicate the winemaker's participation in the Charta (pronounced 'karta'), an organization devoted to making dry wines. This is Germany's largest wine region, with flat, abundant farmland yielding large quantities of grapes. Most of the Rheinhessen's production is Liebfraumilch, a mass-produced wine made mostly with inferior Muller-Thurgau grapes. Riesling is a minor player in the Rheinhessen. The Pfalz is among the most southern winemaking regions of Germany. Influenced by the Haardt mountain range, Pfalz vineyards enjoy a sunny, protected climate where grapes achieve ripeness without as much of the nail-biting tension as in northern regions. Wines here have richer, more exotic flavors, including vanilla, citrus, tropical fruit, and ginger. Riesling is only one of the grapes grown successfully here; quality gewürztraminer, weissburgunder, and spatburgunder are also produced. Kabinett - Light, off-dry wines. The first harvest of the vintage. Spatlese - means "late harvest." Spatlese wines are picked after the Kabinett harvest. Auslese - literally "select harvest." These wines are sweeter and richer in style, and are not produced every year. Beerenauslese (BA) - translates to "berry select harvest." Grapes are picked individually and are usually affected by botrytis cinerea, or noble rot. Creates wine with a rich, honeyed flavor. Trockenbeerenauslese (TBA) - literally "dry berry select harvest." These grapes are picked when they are shriveled, or dried like raisins, by botrytis. TBA wines are made rarely, in small quantities, and are quite expensive. Eiswein - The grapes for Eiswein are picked and pressed while frozen. This process concentrates the juice, making a wine that is rich in both sugar and acidity. 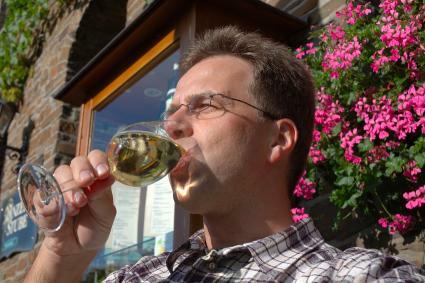 Germany produces primarily white wine grapes, with some lesser-known reds, as well. Riesling - Germany's greatest grape! Muller-Thurgau - An unknown crossing. Germany's most widely planted grape, with high yields and low to moderate quality. Silvaner - Widely planted; good but not great. Weissburgunder - The same as Pinot Blanc. Rulander - The same as Pinot Gris. Spatburgunder - The same as Pinot Noir. Germany's best red grape. Blauer Portugieser - Red wine grape second in importance to Spatburgunder. Dornfelder - This red grape makes fruity, easy-drinking wines similar to Beaujolais. German wine terms can be confusing for the uninitiated. Trocken and halbtrocken - Refers to dry German wines. Trocken, or "dry," wines have fewer than 9 grams of sugar per liter. Halbtrocken means "half dry," and even at less than 18 grams of sugar per liter, they taste remarkably dry as well. Sekt - The German word for sparkling wine. Sussreserve - German for "sweet reserve." This term refers to grape juice retained from the initial pressing of the grapes and added back to the fermented wine in order to sweeten it. Sussreserve was used extensively in the 1970s and 1980s, but has decreased in popularity with the trend toward drier wines. Deacidification - The removal of acidity, allowed only in particularly cold vintages. For many, the first time they try a German wine, it serves as a revelation. Winemakers in Germany infuse wines with crisp acidity, sweetness and tremendous flavor that comes from the earth in which the grapes are grown. Visit your local wineshop and ask for recommendations for a delicious German wine.